ElevenPaths Blog English: How are we preparing ourselves for the RSA Conference 2018? How are we preparing ourselves for the RSA Conference 2018? 2018 is a unique year for us. We continue on our journey with the great security community to jointly combat the threats faced by our sector. At ElevenPaths, Telefónica’s dedicated cyber security unit, we have been working on a new approach, which we will officially announce at the world-leading annual security event, the RSA Conference. 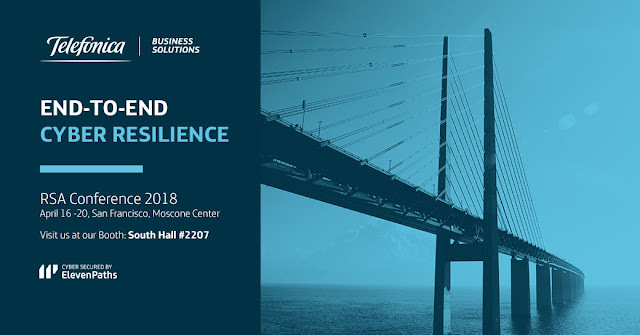 This event will take place from the 16th to the 20th April, in San Francisco (USA), where we will be exhibiting from our stand #2207 in the South Hall of the Moscone Center. You can visit us here for free by registering for an Expo Hall Pass via the official RSA Conference website using our unique access code: X8ETELEF (the deadline to use this code is the 19th April 2018). Having attended the RSA Conference for 3 consecutive years, we know that this is the ideal place to achieve progress, to share new ideas and knowledge, and to find inspiration to overcome the latest cyber challenges that affect our customers in the business ecosystem. That is why, as part of the intelligent global community, we have scheduled meetings, conferences and conversations with the key leaders and pioneers of the security sector, in order to present our vision of integrated security as an intelligent MSSP (Managed Security Service Provider). You can experience the RSA Conference from the comfort of your home, with the dedicated section on our website that covers our participation at the event, including a list of the experts and executives who will be there, and of course, our complete package of solutions that we are going to present. You can access the website here. As the event approaches we will update the website with more information on our product and solution demonstrations so that you can see these first-hand. You can also send any questions or comments into rsaconference@telefonica.com. GO TO OUR RSA LANDING PAGE! Do you want to know more about our new approach? Stay tuned to our social media channels Twitter and Facebook, where we will give full coverage of our activities throughout the event.